When the war broke out, the German Pacific squadron of seven vessels, commanded by Admiral von Spee, was at Kiau-chau, China. Among these vessels were the Emden and the Karlsruhe, both destined to achieve fame as raiders. Early in August, 1914, the German squadron left Kiau-chau to prey upon English commerce in the South Pacific. A British squadron of five vessels, commanded by Admiral Sir Christopher Cradock, was detailed to safeguard British shipping in the South Seas. On November 1, 1914, off the coast of Chile, near Coronel, the German fleet, sighting the British vessels, opened fire with great accuracy at a range of seven miles. The British flagship, Good Hope, exploded and sank, carrying Admiral Cradock to his death. The Monmouth, set on fire, made for the open sea. The four German ships then bore down upon the Glasgow, but she escaped. Early in the engagement the Otranto, an armed liner merely, had disappeared. The fifth ship of Admiral Cradock's squadron, the Canopus, had been undergoing repairs at a port further south. She found the Glasgow the day after the battle and together they proceeded to the Falkland Islands. The German fleet, overtaking the Monmouth on the next day, fired seventy shells into her when she lay sinking, on fire, and helpless, unable to fire her guns. With Admiral Cradock, 1650 British officers and men perished in this battle. 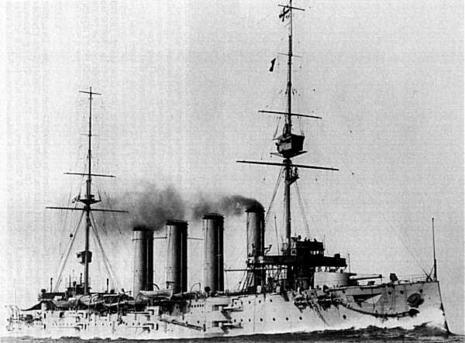 Captained by Captain F Brant at the battle of Coronel, HMS Monmouth was built by London and Glasgow Ship Builders on the River Clyde in Glasgow and was launched on 13th November 1901. Her normal complement was 550-600 men and she had two twin and ten single mount 15.2 cm guns, ten 12lb guns, three 3lb guns and submerged 45.7cm torpedoes. William Wileman Hart. RMB/1681, was a Royal Marines Bandsman aboard HMS Monmouth and due to his having written many letters home detailing his voyage, we are able TO acurately follow the final voyage of the Monmouth from leaving Plymouth on 6th August 1914 to her end on 1st November 1914. The World War I naval Battle of Coronel took place on 1 November 1914 off the coast of central Chile near the city of Coronel. 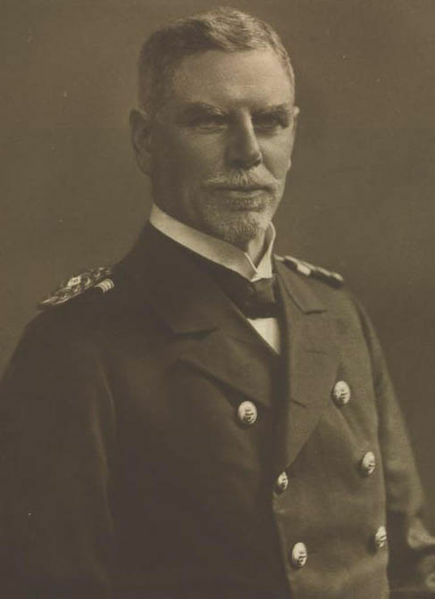 German Kaiserliche Marine forces led by Vice-Admiral Graf Maximilian von Spee met and defeated a Royal Navy squadron commanded by Rear-Admiral Sir Christopher Cradock. The engagement probably took place as a result of a series of misunderstandings. Neither admiral expected to meet the other in full force. Once the two met, Cradock understood his orders were to fight to the end, despite the odds heavily against him. Although Spee had an easy victory, destroying two enemy armoured cruisers for just three men injured, the engagement also cost him half his supply of ammunition, which it was impossible to replace. Shock at the British losses led to an immediate reaction and the sending of more ships which in turn destroyed Spee and the majority of his squadron at the Battle of the Falkland Islands. The Royal Navy, with assistance from other Allied navies, had spent the early months of the war searching for Spee's German East Asia Squadron, fearing its potential for commerce raiding in the Pacific. Spee had abandoned his base at the German concession at Tsingtao in China once Japan entered the war on Britain's side. The British learned from an intercepted radio communication in early October of Spee's plan to prey upon shipping in the crucial trading routes along the west coast of South America. Patrolling in the area at that time was Admiral Cradock's West Indies Squadron, consisting of two armoured cruisers, HMS Good Hope (Cradock's flagship) and HMS Monmouth, the modern light cruiser HMS Glasgow, and a converted liner, HMS Otranto. Cradock's squadron was by no means modern or particularly strong, and most of the crew were inexperienced. Spee had a formidable force of five vessels, led by the armoured cruisers SMS Scharnhorst and SMS Gneisenau plus a further three light cruisers, SMS Dresden, SMS Leipzig and SMS Nürnberg, all modern ships with officers handpicked by Grand Admiral Alfred von Tirpitz. Nevertheless Cradock was ordered to deal with Spee. 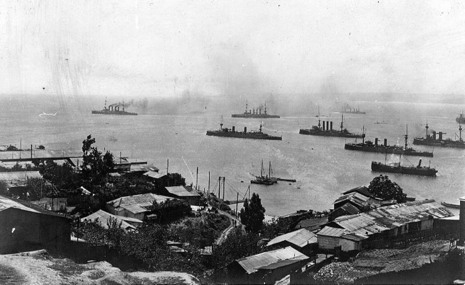 On 18 October 1914 Spee, having learned of the presence of the Glasgow, set off with all five warships from Valparaíso with the intention of destroying her. Cradock, aware that his ships were outgunned by Spee's, had been waiting in the hope of reinforcements. 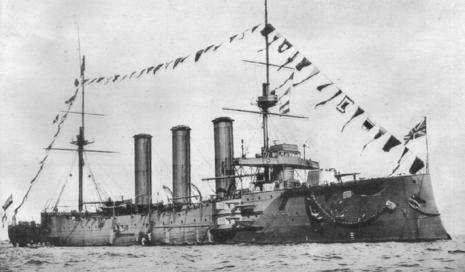 The Admiralty dispatched the armoured cruiser HMS Defence and the elderly battleship HMS Canopus, the latter sent from London. Neither reached Cradock before battle commenced on 1 November 1914. Deciding that he could wait no longer, Cradock sailed from the Falkland Islands to a predetermined rendezvous point with Glasgow at Coronel, the latter having been sent there to gather intelligence. On 31 October Glasgow entered Coronel harbour to collect messages and news from the British consul. Also in harbour was a supply ship, Gottingen working for Spee, which immediately radioed with the news of the British ship entering harbour. Glasgow meanwhile was listening to radio traffic which suggested that German warships were close. Matters were confused, because the German ships had been instructed to all use the same call sign, that of Leipzig. Spee decided to move his ships to Coronel, to trap Glasgow, while Admiral Cradock hurried north to catch Leipzig. Neither side realised the other's main force was nearby. At 09:15 on the morning of 1 November Glasgow left port to meet Craddock at noon, 40 miles west of Coronel. Seas were stormy so that it was impossible to send a boat between the ships to deliver the messages, which had to be transferred on a line floated in the sea. At 13:50 the ships formed into a line of battle fifteen miles apart and started to steam north at 10 knots searching for Leipzig. At 4.17 pm Leipzig, accompanied by the other German ships, spotted smoke from the British line. Spee ordered full speed so that Scharnhorst, Gneisenau and Leipzig were approaching the British at 20 knots, with the slower light cruisers Dresden and Nürnberg some way behind. At 4.20 Glasgow and Otranto saw smoke to the north, and then three ships at a range of twelve miles. The British reversed direction, so that both fleets were moving south, and a chase began which lasted 90 minutes. Cradock was faced with a choice, either to take his three cruisers capable of twenty knots, abandon Otranto and run from the Germans, or stay and fight with Otranto which could only manage sixteen knots. 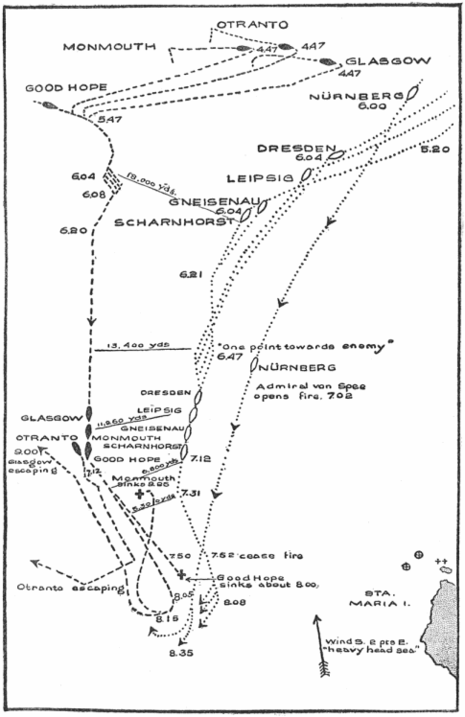 The German ships slowed at a range of 15,000 yards to reorganise themselves for best positions, and to await best visibility, when the British to their west would be outlined against the setting sun. At this stage, it is probable that the British could have escaped by sailing towards Canopus, then some 300 miles to the south. With the failing light, Spee would most likely have lost contact with the British squadron. At 5.10 pm Cradock decided he must fight, and drew his ships closer together. He changed course to south-east and attempted to close upon the German ships while the sun remained high, which from behind his ships would dazzle the German gunners. Spee declined to engage and turned his faster ships away, maintaining the distance between the forces which sailed roughly parallel at a distance of 14,000 yards. At 6.18 Cradock again attempted to close, steering directly towards the enemy, which once again turned away to a greater range of 18,000 yards. At 6.50 pm the sun set, Spee closed to 12,000 yards and commenced firing. The German ships had sixteen 8.2 inch guns of comparable range to the two 9.2 inch guns on Good Hope. One of these was hit within five minutes of the engagement starting. Of the remaining 6 in guns on the British ships, most were in casemates along the sides of the ships, which in the heavy seas continuously flooded if the gun doors were opened to fire. The merchant cruiser Otranto, having only 4-inch guns and being a much larger target than the other ships, retired west at full speed. With the British 6-inch guns having insufficient range to match the German 8-inch, Cradock still attempted to close on the German ships. By 7.30 he had reached 6000 yards, but as he closed, so the German fire became more accurate. Both Good Hope and Monmouth were on fire, presenting convenient targets to the German gunners now that darkness had fallen, whereas the German ships had disappeared into the dark. Monmouth was first to be silenced. Good Hope continued firing, continuing to close on the German ships receiving more and more fire. By 7.50 pm she had also ceased firing, subsequently her forward section exploded, then she broke apart and sank; with no one actually witnessing the sinking. 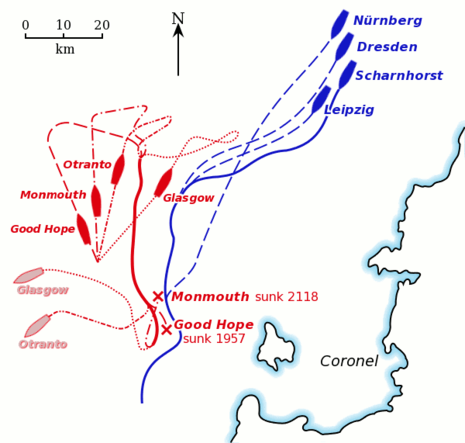 Scharnhorst switched firing towards Monmouth, while Gneisenau joined Leipzig and Dresden which had been engaging Glasgow. German light cruisers had only 4.1 inch guns which had left Glasgow relatively unscathed, but these were now joined by the 8.2 inch guns of Gneisenau. John Luce, captain of the Glasgow, determined that nothing was to be gained by staying and attempting to fight. It was noticed that each time he fired, the flash of his guns was used by the Germans to aim a new salvo, so he also ceased firing. One compartment of the ship was flooded, but she could still manage 24 knots. He returned first to Monmouth, which was now dark but still afloat. Nothing was to be done for the ship, which was sinking slowly but would attempt to beach on the Chilean coast. Glasgow turned south and departed. There was some confusion amongst the German ships as to the fate of the two armoured cruisers, which had disappeared into the dark once they ceased firing, and a hunt began. Leipzig saw something burning, but on approaching found only wreckage. Nürnberg, slower than the other German ships arrived late at the battle, but sighted Monmouth, listing and badly damaged but still moving. After pointedly directing his searchlights at the ship's ensign, an invitation to surrender which was declined, he opened fire, finally sinking the ship. Without firm information, Spee decided that Good Hope had escaped and called off the search at 10.15 pm. Mindful of the reports that a British battleship was around somewhere, he turned north. There were no survivors of either ship (1,654 officers and men). Glasgow and Otranto both escaped (the former suffering five hits but no casualties). Just two shells had struck Scharnhorst, neither of which exploded, whereas she had managed at least 35 hits on Good Hope. Four shells had struck Gneisenau, but had done little damage. The greatest difficulty for the German ships was that they had used approximately half their ammunition, with no means of replacing it. There were no German deaths and only three men had been wounded, on Gneisenau. 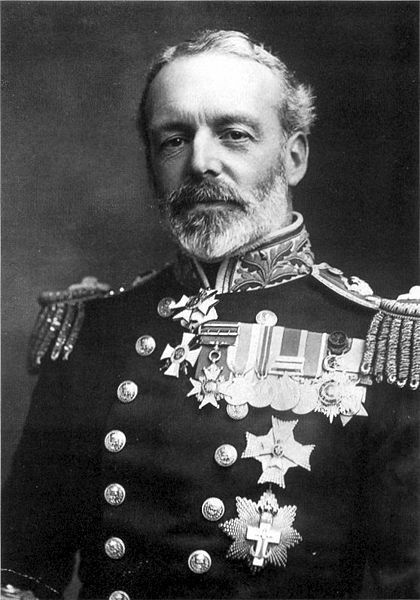 Admiral Spee afterwards commented on the British tactics. He had been misinformed that the battleship Canopus sighted in the area was a modern Queen-class ship, whereas it was a similar appearing, old and barely seaworthy Canopus class battleship, but nonetheless had four 12in guns and ten 6 in. Spee believed he would have lost the engagement had all the British ships been together. Despite his victory he was pessimistic of the real harm done to the British navy, and also of his own chances of survival. Cradock had been less convinced of the value of the Canopus, being too slow at 12 knots to allow his other ships freedom of movement and manned only by inexperienced reservists. The official explanation of the defeat as presented to the House of Commons by Winston Churchill stated: feeling he could not bring the enemy immediately to action as long as he kept with Canopus, he decided to attack them with his fast ships alone, in the belief that even if he himself were destroyed... he would inflict damage on them which ...would lead to their certain subsequent destruction. On 3 November, Scharnhorst, Gneisenau and Nürnberg entered Valparaiso harbour and were welcomed as heroes by the German population. Spee refused to join in the celebrations: presented with a bunch of flowers he commented, 'these will do nicely for my grave'. He was to die with most of the men on his ships approximately one month later at the Battle of the Falkland Islands, on 8 December 1914. On 30 October, before the battle but due to communications delays too late to have any effect, Admiral Jackie Fisher was re-appointed First Sea Lord, replacing Battenberg. Battenberg and Churchill had been considerably preoccupied with fighting to retain Battenberg, a German prince, as first sea lord against widespread concerns that the senior British Admiral was running a war against his country of birth. Battenberg was a proven and reliable admiral, but eventually had to be replaced in the face of public opinion. However, the whole crisis drew the attention of the most senior officers of the admiralty away from events in South America. Churchill later admitted that if he had not been distracted, he would have questioned more deeply the intentions of his admiral at sea. A signal from Cradock was received by Churchill on 27 October, advising his intention to leave Canopus behind, because of her slow speed, and as previously instructed to take his remaining ships in search of Spee. He re-stated that he was still expecting reinforcements in the form of HMS Defence, which he had previously been told was coming, and that he had given orders for her to follow him as soon as possible. Although Defence had once been sent to reinforce Cradock, it had then been recalled part way, returned to the Mediterranean and then been sent again to form part of a new squadron patrolling the eastern coast of South America. A misunderstanding had arisen between Cradock and the admiralty over how ships were to be assigned and used. Cradock believed he was expected to advance against Spee with those forces he had, whereas the admiralty expected him to exercise caution, centering upon Canopus for defence, and merely to scout the enemy or take advantage of any situation where he might come across part of the enemy force. Churchill replied to the signal telling Cradock that Defence was to remain on the east coast and that Cradock was considered to have sufficient forces for his task, making no comment about his plan to abandon Canopus. Churchill had passed on the message to the admiralty staff saying he did not properly understand what Cradock intended. Cradock probably received Churchill's reply on 1 November with the messages collected by Glasgow at Coronel, giving him time to read it before the battle. Thus Cradock would have taken the message as final confirmation that he was doing what was expected. Departing from Stanley he had left behind a letter to be forwarded to Admiral Hedworth Meux in the event of his death. In this he commented that he did not intend to suffer the fate of Rear Admiral Troubridge, who in August had been court-martialled for failing to engage the enemy despite the odds being severely against him, during the Pursuit of Goeben and Breslau. In Troubridge's case the German ships had slipped past him and escaped, and it was possible that Spee might do the same, rounding the Horn and heading for Germany if he did not intervene. The governor of the Falklands reported that Cradock had not expected to survive,, as did the governor's aide. Luce reported that 'Cradock was constitutionally incapable of refusing or even postponing action if there was the smallest chance of success'. On November 3, Fisher in London received news from Valparaiso that Spee had been sighted. He urgently gave orders for Defence to join Cradock, and stressing the need to keep Canopus together with the other ships. On November 4, German reports of the battle started to reach London. This was Britain's first naval defeat since the Battle of Lake Champlain in the War of 1812 and the first of a British naval squadron since the Battle of Grand Port in 1810. Six weeks earlier a German submarine had sunk three British cruisers patrolling the English Channel. Once news of the scale of the British defeat, and its consequent humiliation, reached the British Admiralty in London, a new naval force was assembled under Admiral Sir Frederick Sturdee. This found and destroyed Spee's force at the Battle of the Falkland Islands. Glasgow escaping the battle steamed south for three days at 20 knots passing through the Straits of Magellan. Canopus, warned by Glasgow's messages, turned about and headed back at the best speed she could manage, 9 knots. On 6 November the two ships met and proceeded slowly towards the Falkland isles. Twice during the voyage Canopus had to report that the ship was not under control. After coaling, both ships were ordered north, but again Canopus broke down. She was finally ordered to be beached in the inner part of Stanley Harbour, where she could serve as a defensive battery. Otranto steamed 200 miles out into the Pacific ocean, before turning south and passing around Cape Horn. On 4 November the admiralty issued orders for the surviving ships to move to the Abrolhos Rocks, where a new force was being assembled. 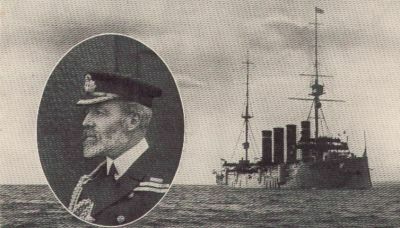 Rear Admiral Archibald Stoddart, with armoured cruisers Carnarvon and Cornwall was to meet them there and await the arrival of Defence. Sturdee was ordered to travel with the battlecruisers HMS Invincible and HMS Inflexible then attached to the Grand Fleet in the North Sea to command a new squadron with clear superiority over Spee.